Today is the first day of November, so that means last night was candy-stravaganza! It also means the next week or so will consist of people trying to unload leftover treats. All holidays are challenging for those of us striving to conquer cravings for sweets, but Halloween is particularly ominous. There tends to be an overwhelming amount of bite-size treats in seductively colored wrappers well within reach at every turn. I have been enjoying uncharacteristic success with my self-control in the days leading up to last night. I celebrated by raiding Cyndie’s secret stash of Reese’s Peanutbutter Cups hidden in a drawer. I ate exactly one and was just fine with that. I think I’m getting the hang of this routine. The longer I go without consuming more sugar than is healthy each day, the less my body craves. 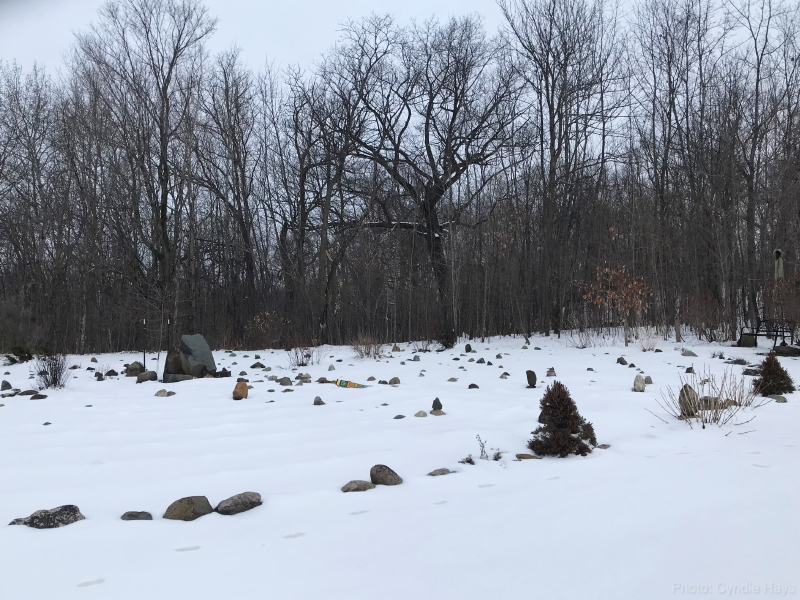 On the way to the airport on Tuesday morning, I mentioned that I would be home alone on Halloween and Cyndie told me where I could find candy if anyone decided to venture up our long driveway and knock on the door. No one did. In the six years we have been here, we have received a total of two visits on Halloween night. Both were by the same family that lives around the corner –a couple of miles away– on two successive years. It’s the only time we have ever talked with them. I’m guessing their son is old enough now that he doesn’t want to be dragged to all these strangers houses by his parents, just to listen to them gab for 20 minutes at each stop. It wasn’t as much trick or treating as it was social networking. Now, after the sun comes up, if there is no toilet paper hanging in our tree branches, and no egg stains on any of our structures, that will be the true, full measure of surviving Halloween. The next thing I need to do is survive the days after. In the end, that’s possibly the bigger challenge. It’s been five years of horse ownership for us now, and we are still coming upon situations that baffle us. 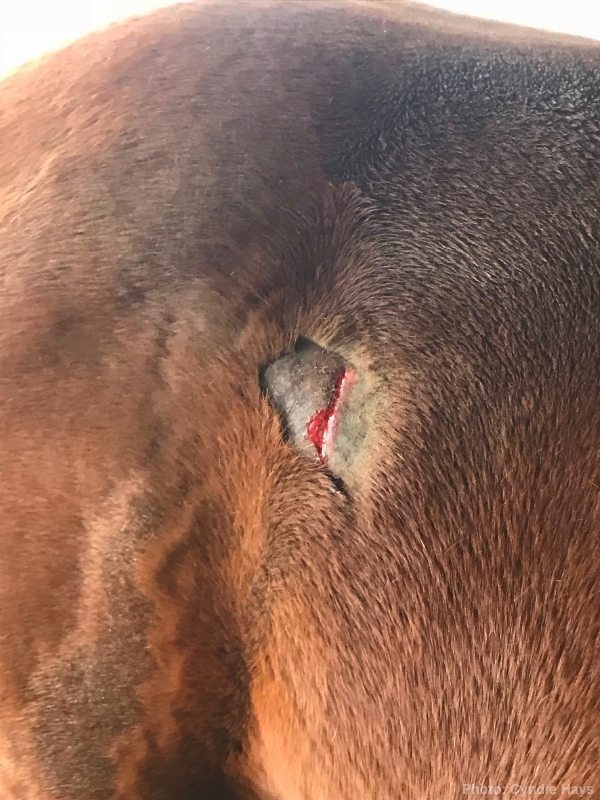 Yesterday, it was a fresh wound on Dezirea’s flank near the point of her hip. There was a dramatic vertical incision, and then a broad area on either side where the hair looks cleanly shaved. I can’t imagine what it must have looked like when she got cut. Best guess is that she was rubbing up against something with a long, sharp edge. It’s possible that it was even something in the ground and she was rolling around and came in contact with the sharp edge. We have yet to identify anything that looks like it might be the cause. I would guess it probably gave her a bit of a jolt when she got cut. It seems likely to me that she would have recoiled or startled in some manner. Must have been a scene in the moment, but by the time we discovered it, she was as calm as if nothing was amiss. Except for that gaping wound on her side. We spent most of the day inside, out of the non-stop wetness around here. Dew point and air temperature have been hovering close together and the moisture doesn’t so much fall as rain as it just hovers in the air in a perfect mist. The ground is thoroughly soaked. 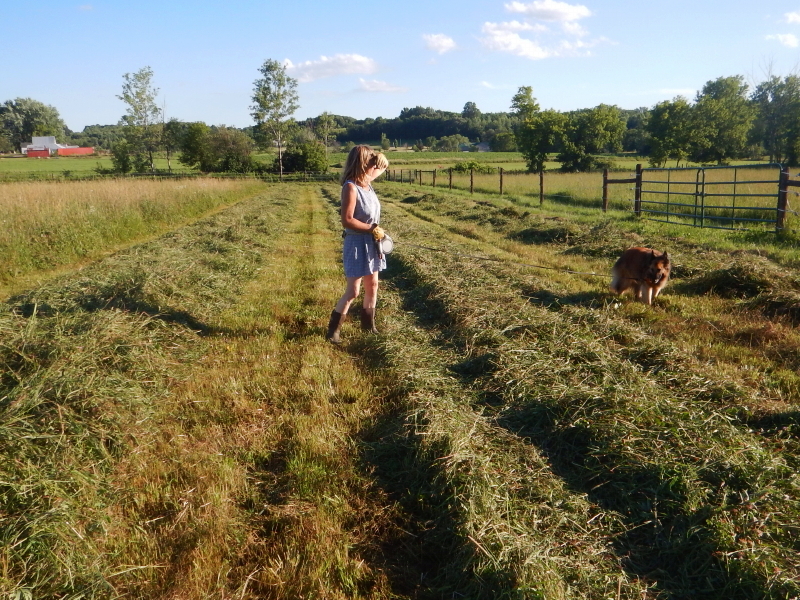 Our neighbor and part-time mail carrier told Cyndie that he was still planning to do a second cut and baling of our hay-field, but that was before this very persistent wet weather pattern settled over us. Next week is looking like repeating days of more rain, so I don’t expect there’ll be any activity in the fields for quite some time. Since we chose to remain indoors, the opportunity to continue our momentum on decluttering was well served. Cyndie had already been through her closet, so I dug in on mine to catch up with her, and then we both went through dresser drawers. Time to release some perfectly useable clothing back out into the world for the purpose it was designed to fulfill. 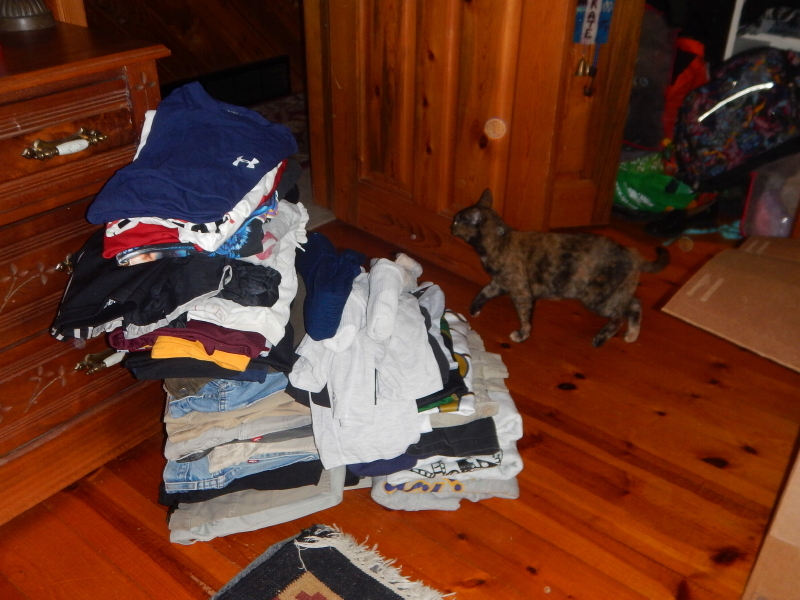 I’m done storing these shirts and pants for years on end. It is truly an exercise that rewards doubly. Our drawers and shelves change from over-stuffed to a much more functional order, and we give others an opportunity to actually wear this clothing again. 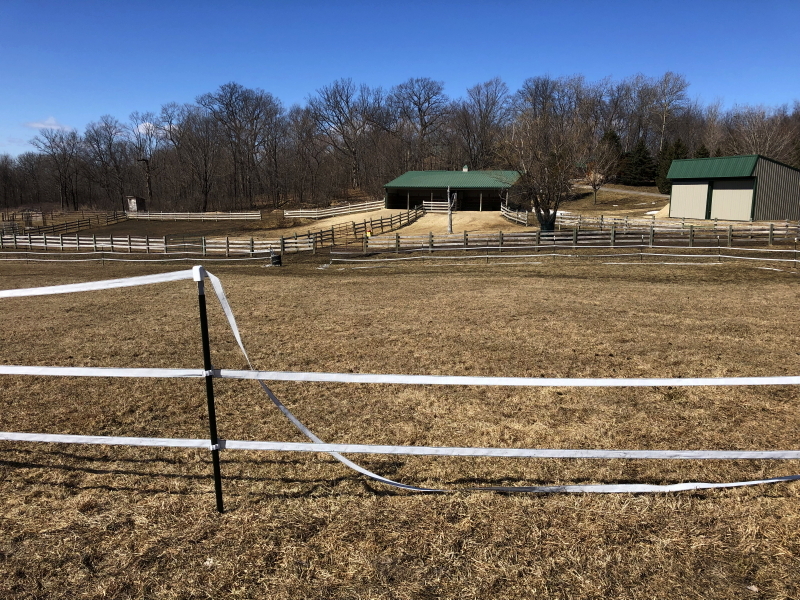 So, not only are we continuing to learn what is involved with owning horses, we are also still learning how rewarding it is to live intentionally aware of our surroundings and how rewarding it is to practice the art of reducing clutter. You could call it the very definition of a continuing education. With all those fat windrows laying in our fields, there was more than enough for us to take a wagon load of bales for ourselves. It took a little creative arranging to fit them in the shed, with our recently purchased bales already stacked to the ceiling, but we found a way to make them fit. 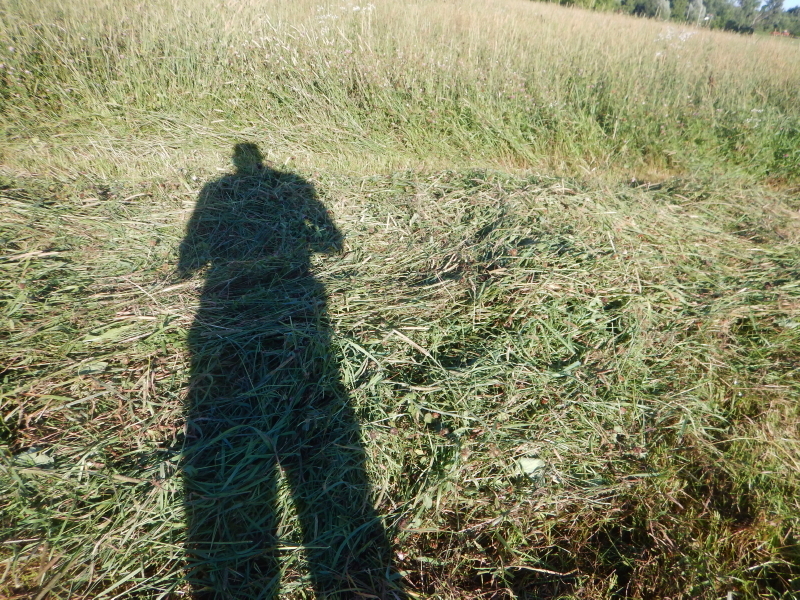 Jody successfully completed baling the last of the windrows, leaving our fields with the clean look of being freshly cut. 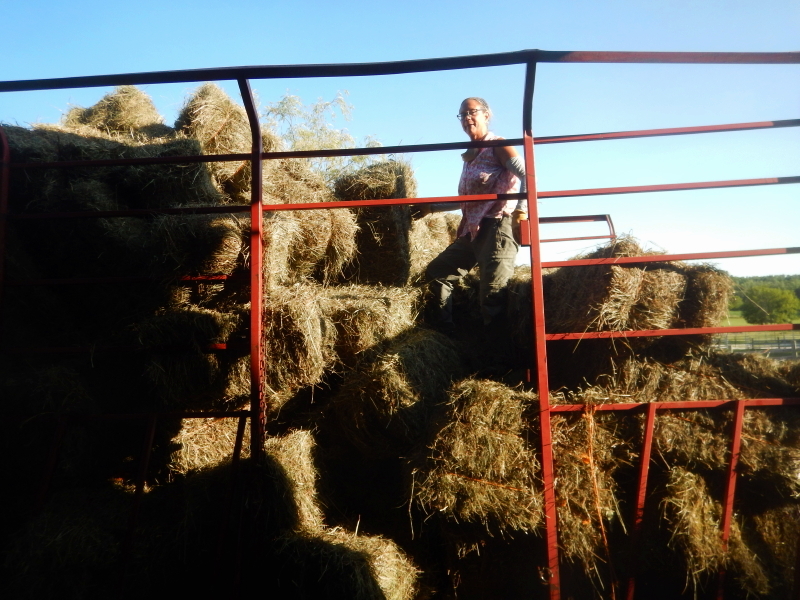 Cyndie climbed the mountain of bales in the wagon and heaved them out for me to stack. We won’t need to go to a gym to get a workout, that’s for sure. There’s nothing like putting in a full day of work and then following that up with an intense effort of throwing more than a hundred bales in the July heat. 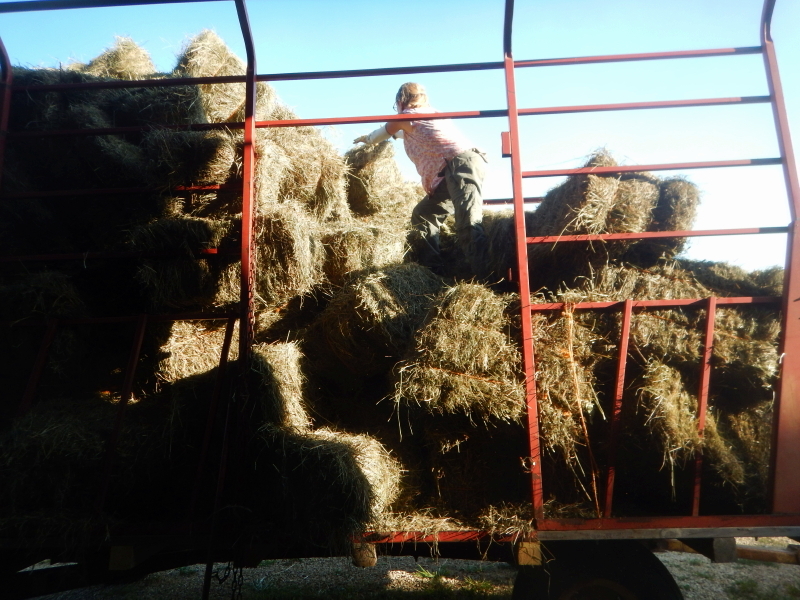 Since we wanted to keep bales from our back pasture, I had some time to kill while Jody finished filling one wagon with bales from the hay-field. 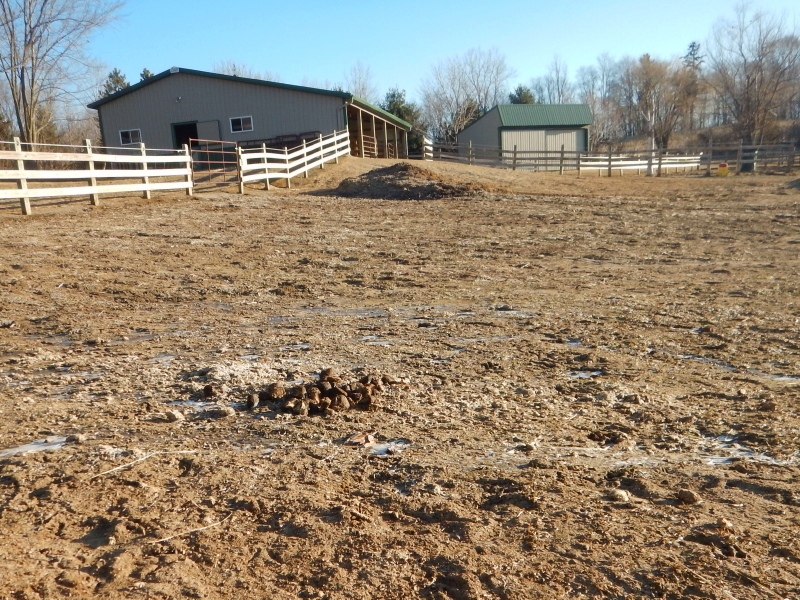 I took advantage of the time to turn and rearrange our composting manure piles. While I was nearing completion of that task, Cyndie called me to meet a neighbor who volunteered to take our miscellaneous metal scrap that was slowly accumulating. That was a wonderful happenstance, allowing me to clean out a pile of ugly metal trash that we’d piled up over the five years we’ve been here. It was a rewarding three-for-one night of accomplishments that left little time for much else. Dinner didn’t happen until 8:30 p.m., and bedtime was a little later than usual, but we were buoyed by the satisfying accomplishments we’d achieved. Once again, we are feeling happy to be done with stacking bales for a while. This time, that joy should last for a much longer span of weeks. With everything around here growing at warp speed, now would be a really bad time to lose the services of our Stihl power trimmer. Isn’t there a law of probability about this? 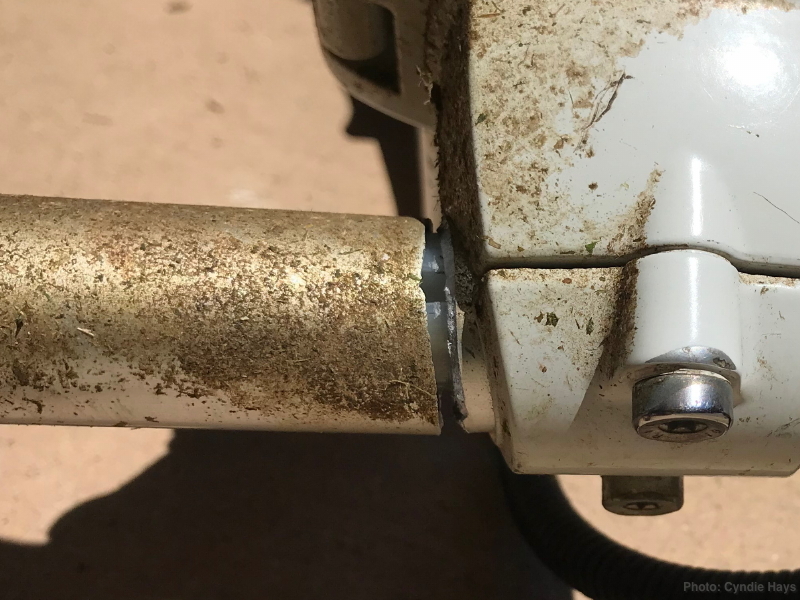 While Cyndie was making headway against the grass jungle taking over the gazebo on Monday, the trimmer became “wobbly.” She discovered the main drive shaft tube had suffered a metal-fatigue fracture. I dropped it off for repair in the evening, but their backlog of work is running at two weeks. It’s scary to imagine not being able to trim for that many days. Cyndie thinks we should buy another one, and I am hard pressed to argue. There have been many times when we both could be trimming at the same time. Pondering this. Something about it doesn’t feel right. I’m driven to balance the logic of a cost-benefit analysis, a crystal ball vision of what our future is here, and that unsettling gut feeling about the expense. Then I need to deal with the fact there is no right or wrong answer in the end. You know me and decision-making. It’s not my favorite thing to manage. One thing that I’m glad that we weren’t relying on me to decide, yesterday we got the details from our neighbor about his plan for the hay-field. It makes total sense to me now. While he was cutting on Monday night, he was listening to the weather forecast. The outlook for rain all day Thursday was holding strong, so he smartly stopped cutting any more than he thought he could get dried and baled by the end of today. We received encouraging news from him about our fields. He said the grass is real thick underneath, likely due to the mowing we did all last summer. In addition, he clarified that the tall grass going to seed was not Foxtail, as Cyndie feared (which is not good for our horses’ mouths), but the premium horse hay staple, Timothy. 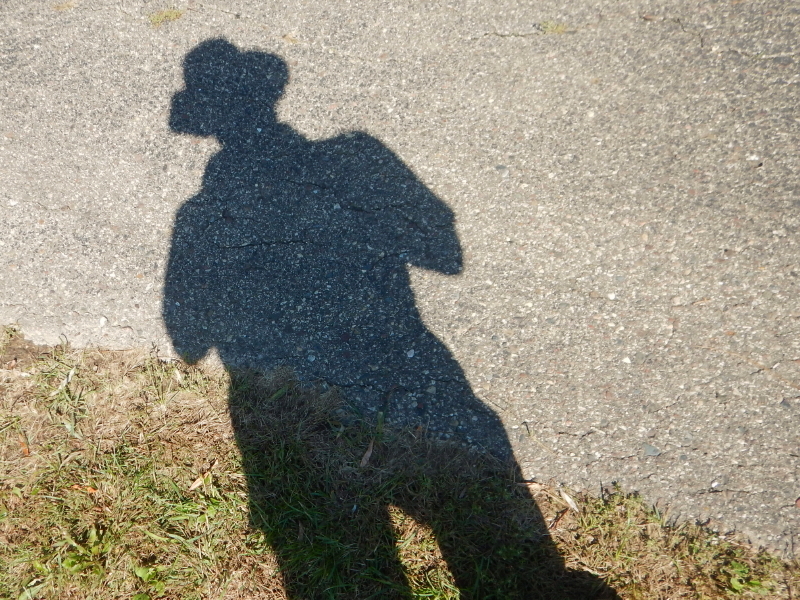 We still have a long way to go in our transition from suburbanites to Ag-wise country folk. Amidst the angst of dealing with equipment failures, it is refreshing to learn some good news about the outcome of our efforts to improve the quality of what is growing in our hay-field and pastures. Despite all the challenges that continue to arise (and decisions thus required), Wintervale continues to evolve in an encouraging way for us.